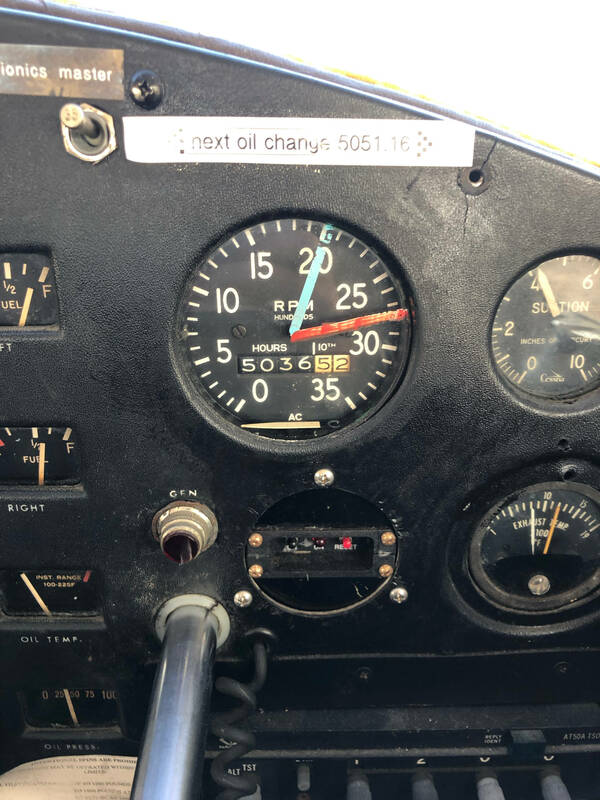 On a long flight in a C150E, the tachometer started bouncing a little bit and the severity of the bouncing gradually increased until it was extreme: The tachometer was spinning in loops and making a loud screeching sound. The counter continues to increment. I understand the tach needle is not powered by any gear mechanism, but rather a small alternator that converts the angular velocity of the tachometer cable into a current which exerts a force on the needle. This should be highly reliable and I don't see how it could cause this behavior. Cessna 150s have a mechanical tachometer driven by a mechanical tach drive cable geared to the engine. The tach needle is moved by sensing spinning magnets driven by the tach cable. They do wear out over time and yours has reached the end of its life. Myself I wouldn't be surprised at all to see 54 year old (from 1965) mechanical tachometer with 5000 hours on it starting to break down from all that age and vibration. ...so the broken one in the plane is likely headed for the trash bin. You'd be nuts to get it overhauled unless you can get someone to do it for that price or less. These old type meters consists of two disks near each other. One is driven to rotate by the cable coming in from the engine (or weels, if measuring the speed of a driving vehicle). The other disk is connected to the needle, and is spring-loaded, so it can't rotate freely. The rotating disk tries to drag the needle-disk along with it, because of magnesizm and currents induced (the actual details are not important, it could be air or a liquid). What matters is that the amount the needle-disk can turn before the force of the spring is equal to the force from the turning wheel, this force is proportional to the speed of the disk. The faster the wheel turn, the further the needle goes. If one of the disks gets bent, or some debris, rust, dirt, bugs gets between the disks, you get the mechanical scratching noise. In this case the needle-disk can start rotating at the same speed as the incoming disk, the spring breaks, and the needle will hit the stop pin from the other side, and will probably break off. So it is "just" opening it, clean out the debris, and fixing a new spring and put the needle back on. I don't have a clue if it is cheaper and at all possible to either fix or replace it, giving that a repaired flight instrument have to be certified, I understand. Also, as the digit drums turned as usual shows, there is nothing wrong with the cable or the drive on the engine. EDIT: If I imagine the worst case, the inside of the cable could be too long, causing the rotating disk to be pressed inwards, ruining the bearing so the two disks touch each other. Or a sealing might have gone bad in the engine end, causing oil to meander inside the cable into the meter. Or the bearings in the meter have finally worn out after many years of use. This exact chain of symptoms happened to me on an automotive speedo - wobble, screech, increaing to extreme wobble, needle falling off, odo still working... exacerbated by low temperature in my case. This is due to old lubricant not having the correct viscosity due to hardening up from age. It was like this for many hours. I put a drop of oil in the right place, and it was fully cured and the repair held for over a year so far. The needle snapped back on, but it took some iterative testing to get it to point correctly. So I expect your unit should be very repairable. Of course, being aviation, this work must be done by someone certified. The crux of the work would be comparable to what I did, but with proper testing and formalities. The most likely cause of this problem is a lack of lubrication in the drive shaft for the tachometer. It might be fixed temporarily by disconnecting the tach drive shaft from the tach head, removing the drive shaft, lubing it, and forcing some oil or grease down the shaft. Or you could replace the entire drive cable assembly. Please note that this level of maintenance is not allowed to be done in the United States by the pilot/owner as preventative maintenance by 14 CFR Section 43. Legally you will need a sign-off by a repairman holding an Airframe and Powerplant license, aka an A&P. Most C-150's had a Stewart Warner tachometer. They are considered disposable because they are assembled by crimping the front bezel on to the case. Also neither an A+P or an IA can work on an instrument. This is a job for a repair station with the correct rating. If you can find such a repair station, they will laugh at you. If you buy a high enough quality tach you might be able to get an instrument shop to paint the markings on the face, otherwise you will have to put them on the glass. Not as nice, but either way you must have both the tachometer and the proper markings. Not the answer you're looking for? Browse other questions tagged aircraft-maintenance flight-instruments piston-engine cessna-150 or ask your own question.